Donkey Kong is of the true legends of arcade gaming, right up there with Space Invaders and Pac Man, and which introduced the world to Mario. This remake is one of those games which is kind of difficult to recommend, as although it updates the visuals quite nicely, it doesn't really do anything else different and at the end of the day, you're probably better off sticking with the original. 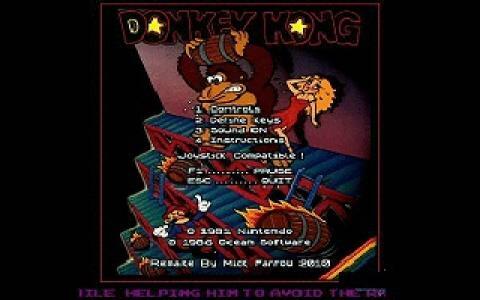 Just in case you've never even heard of Donkey Kong, the idea here is that you control little Mario the plumber through a series of single screen levels in order to get your gal back. 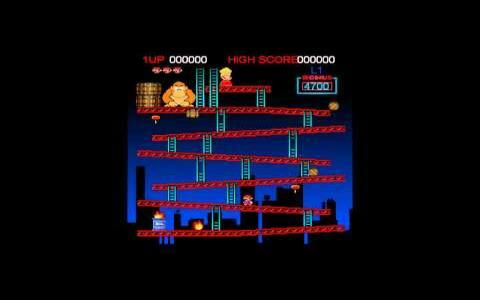 At the top of the screen is DK himself, who hurls barrels and other hazards at you, so it's your job to negotiate the platforms, jumping over the barrels and climbing up ladders to get to the top. You can grab a hammer to turn the tables on the bad guys for a while and like other games from the period, the main goal here is simply to rack up those points and get your name on the high score table. There's no denying that this is a mostly faithful adaptation of the classic original but like many such copies, it lacks the soul and heart of its inspiration. The update's best feature is the new visuals, which capture the look and feel of Mario, DK, and so on but with a slightly more modern, cartoony twist. The gameplay too remains enjoyable, although the controls and movement feel a little off, particularly if you're familiar with the original. The music is awful though, and doesn't fit the game at all, while you can't help but wish some new levels or features had been added to really make this worthwhile. As it stands though, this is perhaps best left on the shelf in favor of the original and best.